Colombia is a country that many are eager to visit now that its dark past is firmly in the past. Travelers who are interested in seeing a country before it becomes a major tourist destinations have been exploring and discovering the many great things about Colombia for many years now, and it’s clearly becoming a more mainstream vacation choice. The large cities like Bogota, Medellin, Cali and Cartegena are at the top of traveler’s bucket lists these days, and for very good reason. There is a lot to explore in Colombia, beyond the incredibly popular coffee culture and the incredible sweeping views that can be had from the viewpoints high up on the mountainsides outside Bogota and Medellin. Go for the food, the salsa dancing, the immense outdoor activities, even the aguardiente! ★ See Colombia on a 9-day Classic Tour to some of the top cities and destinations throughout the country with G Adventures! The weather in Colombia is a tropical, Amazon-influenced climate and is wet year round, though slightly less so from Dec – March and July – August. Don’t let the rain stop you from visiting (or you may never go!). There are four distinct season in Colombia, so you can base your visit on the type of temperature you prefer, though it never really gets super hot or super cold. The high tourist season in Colombia is from December to March, when the rain is lighter, and the few weeks surrounding Easter (Colombia is a very Catholic country). This is when prices will be highest, and you’ll see the most tourists in the cities. You may choose to avoid the high season and travel to Colombia in the more mild months of June or October. Of course, the weather can change greatly depending where you are, because Colombia has a lot of varied topography, with many valleys and peaks. Always check the weather where you’re going before deciding to activities like hiking, skiing or rock climbing, which can be greatly affected by the weather. The largest city (and capital) in Colombia is Bogota. The city’s cultural epicenter, La Candelaria, is a magnet for tourists looking to experience the still raw, but cosmopolitan excitement of the city. Probably the most strikingly beautiful city in Colombia is Medellin. Its narrow valley and sharp hillsides jam-packed with houses, speaks of both the old and the new life of a city that has a lot going for it. Cali is where you’ll find the party. The home of salsa, Cali seems to be alive with the music and dancing that defines it. Not the city you’d go to for typical tourist activities, it’s where you’ll find life happening. A fairytale city on the Caribbean coast, Cartegena beckons beach fans and history lovers alike. Cartagena’s Old Town is a Unesco World Heritage site with cobblestones and colonial architecture. Go on the free walking tour with Beyond Colombia (we really enjoyed our tour with Hector). Another great walking tour to take is a street art tour. Check out the great museums. We especially liked the Gold Museum, the Botero Museum and the Colombian National Museum. Spend some time at a coffee shop, like Arte y Pasion, where you can take a coffe tasting class, or just sit back and order your favorite coffee, made by your favorite method, with your favorite latte art on top. There are a great many things to see outside the city too, like to Lake Guatavita, La Chorrera Waterfall, and the Zipaquira and Nemocon Salt Mines. Medellin is an exciting city. There’s a lot going on all the time, and so much that you have to check out while you’re there. More so than any other city I know of, Medellin captures the hearts and minds of visitors and sometimes even causes them to stay there well beyond their planned time. One thing I can definitely say from having spend only a small amount of time there, is that the people are incredibly friendly and welcoming. The trip to the top of the mountain on the Metrocable, from where you can transfer to another cable car that takes you to Park Arvi in just 15 minutes. At Park Arvi, you can walk the trails for miles around (though some require a guide). Check out Medellin’s many plazas and parks – especially Plaza Botero, Parque Berrio, Jardín Botánico, and Parque Explora. Hang out in a cafee and sample the many, many amazing coffees that Colombia has to offer – we even took a coffee tasting class at the Toucan Cafe. Explore the neighorhoods of El Poblado (great shopping) and Communa 13, where you’ll find the popular escalators (Escaleras Electricas) , along with some great street art. Go on a day trip outside the city to see Guatapé (Pueblo de Zocalos), home to the magnificent Peñol Rock (La Piedra del Peñol) and Lake Guatape. For a real insider perspective on Colombia and what you should do and see there, check out this comprehensive guide to Colombia, packed full of everything you’ll need to have a great travel experience. You can choose from many different types of accommodations in Colombia. The experiences range from chic hotels to budget hostels. Of course, we focus on affordable luxury accommodations, so those listed below fit with that standard. but be sure you’re really hungry before ordering it. There is a lot of corn in Colombian food, both on the cob and off, and corn meal is used to make the dough for many of the local specialties, like arepas and empanadas. Be sure you try these two foods (don’t worry, you can find them everywhere! ), but make sure they are fresh and hot when ordering. 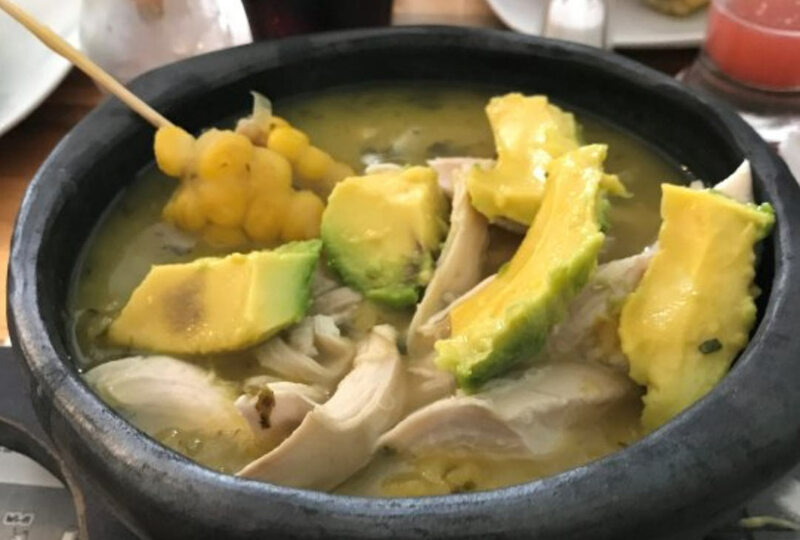 Another specialty in Colombia is ajiaco soup, which is a corn and potato based soup packed full potatoes, chicken, corn and avocado., with crema on the top. Colombia is known for its massive coffee culture. Not only is coffee one of the major exports from Colombia, and an industry that supports many of its people, more coffee is consumed in Colombia than almost any other country. There are cafes and specialty coffee shops everywhere. And they take their coffee drinking very seriously. If you don’t know that much about coffee, you can take a tasting course and learn about it while you’re there. Make a note, the locals call it “tinto”. You can’t go to Colombia without trying aguardiente, which is the national liquor. It’s not too strong (especially if you get the one with no added sugar), and it tastes of anise. You might also want to try chicha, a drink that was made by the indigenous people from the Andes, which is made from fermented corn and sugar. Due to the large amount of tropical fruits in Colombia, fruit drinks and smoothies are very popular, as is Aguapanela, which is water and cane sugar. By reading this Colombia Travel Guide, you now know what to do and where to go, and have sorted out the right time to visit Colombia, haven’t you? So, pack your bags and book your tickets, because Colombia awaits you!